Kona (KOA) International Airport at Keahole is located about seven miles northwest of Kailua-Kona. 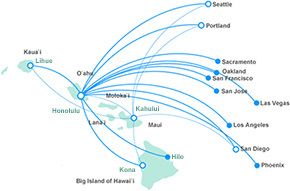 This “dry side” location on the western side of The Big Island/Hawaii is one of the larger Hawaiian airports. Although you must take a shuttle to your rental car location, the ride takes fewer than five minutes, and shuttles come by the baggage area every few minutes. You might wish to pick up your rental car while your luggage is still in transit from plane to Baggage Claim area. When you return to Baggage, it’s possible you might have arrived before your luggage.